Reading is one of my life long favorite activities. Even so, I often find myself, in this season, busy and not making the time for sitting down with a book. That said, one of the ways I have sought to redeem all the time I spend driving is with audio books. It has taken me some time to get a good rhythm and mindset for audio book reading. I am a crazy note taker, line highlighter, and corner folder but that is not something one can do while driving! There was a struggle for a while I tried to think of a way to take notes but safety won over and I’ve let that go. Instead I now choose books for enjoyment and remind myself to trust that nuggets of truth and creativity will settle in my mind and continue my growth and understanding in life without the notes. 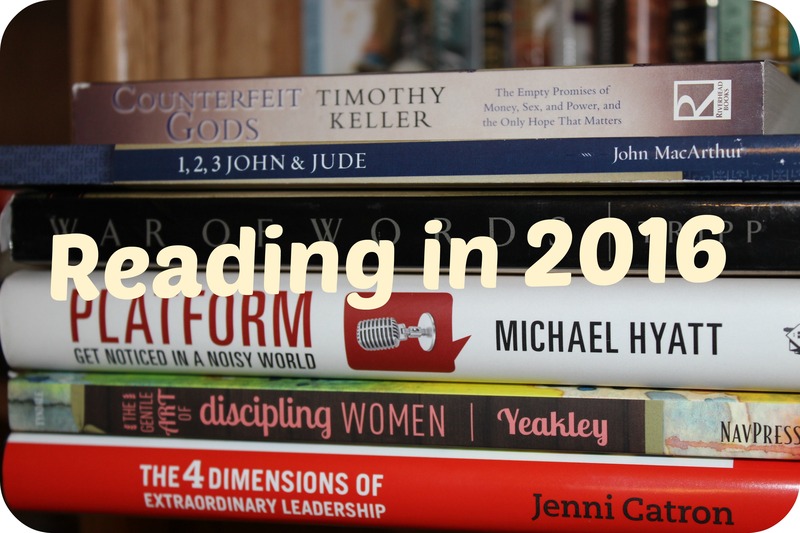 Overall I read 23 books in 2015. My favorites were Dear Mr Knightly, Around the World in 80 Days, Wherever the River Runs, When Invisible Children Sing and Fringe Hours. Dear Mr Knightly and Around the World in 80 Days were audio books, and I enjoyed each of them immensely. It was a wonderful adventure to travel with Mr Fogg around the world and to grow along with sweet Samantha Moore. The enjoyment those two particular books gave me has prompted me to purposely choose a good balance of fiction along with all my nerdy non fiction reads for 2016! When Invisible Children Sing was one of those books where the story grabbed me and left me feeling all the feelings. What joy it was to find hope woven into all the true hard. I desire to know more about the countries and communities where our sponsored children live, and having read this book, I feel that can relate better to Angelica and Laura. We sponsor those two young Bolivian ladies through Compassion International. By understanding better how life is in a community, I can use that information to better encourage the children with my letter writing. Wherever the River Runs is a book that was recommended to our El Salvador travel group, as we prepared for the trip. It is a fantastic story of Kelly Minter’s journey and discovery in Brazil and in her faith. I plan to reread the book in the near future. Fringe Hours is a book that I had the pleasure of taking part on the launch team for. Books and messages that say “you’re worth it” don’t usually fly with me, but I was blessed tremendously by this book. The balance of caring for her family, the fantastic teamwork she experiences and demonstrates with her husband, working outside her home and the love she has for women all combined to created an authentic message of caring for self to better care for other. I’ve adopted the term “fringe hours” and now enjoy regualarly planned fringe hours activities that refresh, encourage and satisfy me, as well as often blessing my family. How about you? What where your favorite books of 2015? Do you have a favorite fiction book to recommend to me? Please let me know in the comments.